This warmer comes from a relatively new company called Boon. The US based firm (Chandler, Arizona) promises to deliver not only stylishly designed and functional baby product but also offer them at competitive price level. Their Orb warmer meet all these pledges. The device is well design to consume as little counter space as possible yet retain functionality and reliability. It’s white and spherical in shape. The minimalistic design of Boon Orb embodies the same idea standing behind Avent Express Bottle Warmer. The wide stable features non-skid base to keep it in place. This also makes operating it with one hand easy. There are green accents on it and two of them are round button-like wheels. One on the front and one on the back. The one on the front is a an on-off button and one on the back is in fact a lid of a graduated tube that is located inside the warmer. It serves as a measure for water and after filling the chamber can be stuck back inside the warmer. 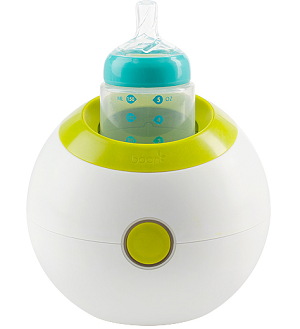 The wide chamber accommodates not only regular bottles but also wide neck type bottles such as Tommee Tippee, Avent Natural, Medela, Dr. Brown and even Comotomo. For some wide bottles to fit the green insert around the neck of the warmer has to be removed. 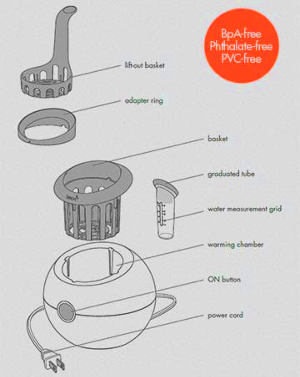 Boon Orb also comes with a special insert which can be used with thinner bottles. You can also use it to heat up baby food jars in it. A special basket (included) comes handy to place them inside and remove from the heating chamber. There is blue light that comes on when the warmer is turned on and comes off when the heating process is completed. There is, however, no auditory signal indicating that the bottle is ready. This warmer is extremely easy to use. The only thing you need to know is how much water to use. You can find this information in the manual. Once you know how much water is needed for the type and size of bottles you use you just pour it into the chamber and turn the device on. There is no need to adjust temperature or time. As the heating medium it this case is steam the bottle warms up quickly and uniformly. It will also automatically switch off when finished. This auto-off feature is the most important advantage over Avent Bottle Warmer and is not only handy when walking around the house with crying baby but also provides additional level of security in case you forget to switch it off. Important think before using it both for the first time and when you decide to use different bottles is the cooling time. After each use when the warmer switches of you need to wait for 10 minutes to turn it on again. So makes sure to read the manual and get accustomed with the amount of water to use. Otherwise if you use not enough water you may end up with a bottle still cold and a crying baby in your hand. Waiting for 10 minutes in such circumstances is guaranteed to be stressful. This is why reading the manual ahead is so important. You may also leave testing new bottles with this warmer for other times than 3am. 10 minutes cooling time (this is normal for steam warmers). See also our comprehensive review of top bottle warmers that include all popular devices on the market.